Caution reasserted itself on Wall Street Friday, sending stocks sharply lower but not enough to prevent the market from heading for its third straight weekly advance. At the closing bell the Dow had sunk 148.38, or 1.9 percent, to 7,776.18. The Standard & Poor's 500 index fell 16.92, or 2 percent, to 815.94, and the Nasdaq composite index dropped 41.80, or 2.6 percent, to 1,545.20. Major market indexes fell about 2 percent, but most analysts agreed that the pullback was a natural response to the market's powerful climb this month. Financial and technology stocks led the retreat, and energy shares fell along with the price of oil. A dip in personal incomes and a slowdown in personal spending gave investors reason to cash in some of their willing after the Dow Jones industrial average surged 21 percent over just 13 days. Analysts said the sentiment in the market was still more upbeat than it was a month ago, but the economic numbers were a reminder that the economy and the banking system remain troubled. "There is still a definite caution in the air," said Doreen Mogavero, president of Mogavero, Lee & Co., a New York floor brokerage, adding that she's noted some hesitance among her clients. "I don't think people are completely invested yet." Mogavero noted that the money that has gone into the market over the last few weeks has been "short-term" in nature, which leads her to believe that most people are not convinced that the economy will soon recover. The market has been ratcheting up and down over the past week. Analysts weren't surprised by its retrenchments, including Friday's, because no one expects such a weak market to move consistently higher. And many analysts believe back-and-forth trading is actually a healthful way for stocks to recover, because it reflects a conservative rather than euphoric attitude among investors. Still, it was too early to tell whether the big March advance might go the way of Wall Street's year-end rally, which was more than wiped out in January and February. Although the gains of the past three weeks have been based on early signs of improvement in the banking system and the economy, those advances are vulnerable to critical economic data due next week and first-quarter earnings reports that will begin in a few weeks. The Dow is on pace to show a 10 percent gain in March. The last time the blue chips gained at least 10 percent in a month was in October 2002. The economic reports due next week include the March employment report on Friday. Although the report is likely to show more job losses, analysts believe the market can keep rising if there are other data showing the economy is improving or at the very least stabilizing. "While the employment report is key," said Stuart Schweitzer, global markets strategist at JPMorgan Private Bank, "company earnings announcements will shed light on where we go from here because they will tell us how much more restraint companies may need to show in the future." On Friday, the Commerce Department said personal spending rose 0.2 percent in February, as expected, down from a 1 percent gain in January. Personal incomes fell 0.2 percent. Disappointing announcements sapped strength from technology companies. Tech stocks had surged Thursday and pushed the Nasdaq into positive territory for the year. Internet powerhouse Google said it is laying off nearly 200 workers, and technology consulting and outsourcing firm Accenture lowered its forecast for the quarter and the year. Google shares fell $5.42 to $347.87, while Accenture dropped $4.12, or 12.9 percent, to $27.84. "Google has really high operating costs anyway, so for them to say 'OK, the economy's bad. We're not making the money in sales and ad revenue like we used to. It's time to just kind of trim the fat,'" CNET senior editor Natali Del Conti told CBS News. Falling oil prices sapped demand for energy stocks. Oil fell below $53 a barrel Friday, a day after hitting a high for the year, as investors worried that crude's recent gains aren't sustainable amid lingering doubts about the economy. Crude oil fell $2 to $52.34 a barrel on the New York Mercantile Exchange. Shares of Exxon Mobil Corp. dropped 92 cents to $70.31, while Chevron Corp. fell 90 cents to $69.27. Financial companies were mainly weak too, after President Barack Obama met with the chief executives of the nation's largest banks. Obama and Treasury Secretary Timothy Geithner are preparing to launch a partnership with private investors to buy banks' toxic assets. 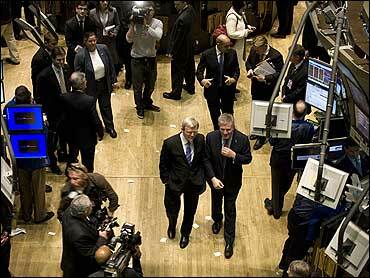 Citigroup Inc. dropped 12 cents, or 4.3 percent, to $2.69, while JPMorgan Chase & Co. fell $1.07 to $28.03. General Motors Corp. rallied for a second day as investors remained optimistic that the government would rescue the ailing automaker. GM rose 22 cents, or 6.5 percent, to $3.63 in afternoon trading, having earlier jumped as much as 15.5 percent. The gains followed remarks from Obama on Thursday promising to offer a new aid package to GM and Chrysler LLC in the coming days. Mike Stanfield, chief executive of VSR Financial Services, an Overland Park, Kan.-based securities broker-dealer, has been telling investors to shift into large-cap growth stocks and energy ahead of an economic rebound. Still, he remains cautious. "We're not encouraging anyone to go all in," he said. Stanfield is telling investors to return to a more traditional mix of stocks and bonds. In other market action Friday, the Russell 2000 index of smaller companies fell 11.76, or 2.6 percent, to 433.54. For every advancing stock there were about three declining stocks on the New York Stock Exchange. Volume came to 955.1 million shares. Government bonds fell. The yield on the benchmark 10-year Treasury note, which moves opposite its price, rose to 2.76 percent from 2.74 percent. Overseas, Britain's FTSE 100 fell 0.8 percent, Germany's DAX index fell 1.4 percent, and France's CAC-40 fell 1.8 percent. Japan's Nikkei stock average fell 0.11 percent.